If there is one thing that baseball players and coaches have to say about slugger Jim Thome, it is that he is a nice guy. Thome has a reputation for being a relatively calm influence in the clubhouse and known for his dedication to the game and his teammates. Most teams that have had him on their roster offer only glowing reviews of his performance on and off the field. Of course, that reputation for being nice extends into all aspects of his life. For example, off the field, he is known for his dogged and determined work with charities that assist children around the world. 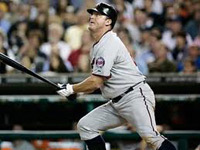 How much does Jim Thome dedicate to charity? Enough that the magazine called The Sporting News, in 2005, named him their “Number 1 Good Guy” for the work he had done raising funds for charities in his home in Peoria, Illinois. 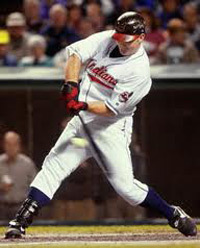 Thome’s work ethic comes from his uprbinging in Peoria, and he made his mark and his name in the big leagues by slugging out the homers for the Cleveland Indians between 1991-2002. He then moved over to the Phillies from 2003-2005. He was with the White Sox from 2006-2009, then the L.A. Dodgers, back to the Indians and, now, back to the Phillies. During that career he has amassed 605 home runs, 2,295 hits, 1,677 RBI and 2,500 strikeouts. Those stats are impressive by any standard when it comes to baseball abilities. 2012 ended up being another big year for Thome as the Orioles ended up in a hotly contested pennant race. Now that that is over, however, the big work that is near and dear to Thome’s heart really starts. In 2001 Thome was awarded the Marvin Miller “Man of the Year” award for his work with the United Way. He also served as the honorary co-chairman of the United Way’s Home Run Derby from 1998 to 2002. During his time there the charity raised over $200,000 for programs sponsored and run by United Way. Thome has also spent time raising money for the Children’s Hospital of Illinois, based out of Peoria. He is also very active in the Make-A-Wish Foundation, going as far as dressing like Santa Claus and visiting sick children during the holidays. Jim was part of the Tug McGraw Foundation, which is a foundation dedicated to helping people with brain tumors. Plus, Thome is known to seek out charities in the cities where he plays, so he has actively raised money for charities in Cleveland, Chicago and Baltimore. He and his wife are known to spend much of their free time at events designed to raise money and help those who need it. The list goes on and on. During the off season, and particularly during the holidays, Jim Thome and his wife are known to raise thousands of dollars for childrens’ charities and spending their time visiting children in need all across the country, but particularly in and around Jim’s home state of Illinois. In short, Jim Thome earns his reputation as being a nice guy while working with his teammates, but also during his off time by supporting children and charities back home. He is a man who gives, and there’s no denying that, no matter how his season turns out.